The Bristol fighter's basic design stemmed from design studies by Frank Barnwell in March 1916 for an aircraft in the same class as the R.E.8 and the F.K.8 - the Type 9 R.2A with the 160 hp Beardmore engine and the R.2B, powered by the 150 hp Hispano Suiza. Neither type was built as the new 190 hp (142 kW) Rolls-Royce Falcon I inline engine became available, and Barnwell designed a new aircraft around the Rolls-Royce engine. This, the Type 12 F.2A was a more compact design, intended from the outset as a two-seat fighter: it first flew on 9 September 1916. The F.2A was armed in what had by then become the standard manner for a British two-seater: one synchronised fixed, forward-firing .303 in (7.7 mm) Vickers machine gun, and one flexible .303 in (7.7 mm) Lewis Gun mounted on a Scarff ring in the observer's rear cockpit. The Bristol M.R.1 is often described as an "all-metal version of the F.2b". In fact it was a totally new design - although it shared the characteristic of having the fuselage positioned between the upper and lower wing. Two prototypes were built, the first flying on 23 October 1917, but the M.R.1 never entered mass production. The Type 15 was fitted with a 200 hp (150 kW) Sunbeam Arab piston engine. This motor suffered from chronic vibration and the "Arab Bristol" was never a viable combination, in spite of prolonged development. A few Arab-engined Bristols were at the front very late in the war - but most British reconnaissance squadrons had to soldier on with the R.E.8 and F.K.8 until the end of hostilities. The United States Army Engineering Division had plans to develop and build an American version of the Bristol Fighter. But efforts to start production in the United States foundered against the mistaken decision to power the type with the 400 hp (300 kW) Liberty L-12 engine - a totally unsuitable engine for the Bristol, as it was far too heavy and bulky, the resulting aircraft being nose heavy, with only 27 of the planned 2,000 being built. Efforts to change the powerplant of American Bristol Fighters to the more suitable Liberty 8 or the 300 hp (220 kW) Hispano-Suiza came up against political as well as technical problems, with one each of the Hispano-engined Engineering Division USB-1A and the Liberty L-8-engined Engineering Division USB-1B built. Limited numbers of aircraft designated XB-1 and later XB-1A (with Hispano or Wright engines) were built postwar. Picture - A Bristol F.2B Fighter of No. 1 Squadron, Australian Flying Corps in Palestine, February 1918. More flexible, aggressive tactics soon proved that the new Bristol was by no means as ineffective in air-to-air combat as its first encounter with the enemy seemed to indicate. In fact it was eventually realised that the type was fast and manoeuvrable enough to be flown in combat more or less like a single-seat fighter; the pilot's fixed forward-firing gun served as the principal weapon, with the observer's flexible gun serving mainly as an additional "sting in the tail". Flown in this manner the Bristol Fighter was a formidable opponent for any German single-seater. In September and October 1917, orders for 1,600 F.2Bs were placed and by the end of the First World War, the Royal Air Force had 1,583 F.2Bs in operation. A total of 5,329 aircraft were eventually built, mostly by Bristol but also by Standard Motors, Armstrong Whitworth and even the Cunard Steamship Company. After the war, F.2Bs continued to operate in army cooperation and light bombing roles throughout the British Empire, in particular the Middle East, India and China. The F.2B also served with the New Zealand Permanent Air Force and RAAF as well as with the air forces of Belgium, Canada, Ireland, Greece, Mexico, Norway, Peru, Spain and Sweden. 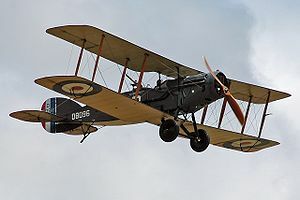 It was not until 1932 that the F.2B was finally withdrawn from RAF service, the last "Brisfit" unit being No. 20 Squadron RAF stationed in India. The type lasted a further three years in New Zealand service. In 1920 Poland bought 107 Bristol Fighters, thus becoming the second largest user of this type (105 with Hispano-Suiza 300 hp/220 kW engines, two with RR Falcon III). It was most numerous Polish aircraft type at that time. Forty were used during the Polish-Soviet war from July 1920, among others in battle of Warsaw, for reconnaissance and close air support. The rest became operational only after hostilities. Two were shot down by ground fire, one was captured by the Soviets and several were lost in crashes. They served in Poland for reconnaissance and training until 1932. Afghan Air Force operated three aircraft from 1919 and retired by 1929. Polish Air Force operated 107 Bristol F.2B Fighter in 1920-1932. The Canada Aviation and Space Museum owns a second example, D-7889. The New Zealand film director Peter Jackson owns D-8040, which flies from the Omaka Aviation Heritage Centre, which also holds a second original fuselage. Mus�e Royal de l'Arm�e, Brussels. Bruce, J.M. "The Bristol Fighter". Flight, 7 November 1952, pp. 587-591. Kopański, Tomasz Jan. Samoloty Brytyjskie w Lotnictwie Polskim 1918-1930 (British Aircraft in the Polish Air Force 1918-1930) (in Polish). Bellona, Warsaw: 2001. ISBN 83-11-09315-6.